Melissa Aho sobbed when she saw the gap tooth fence, five months after her daughter nearly died there. 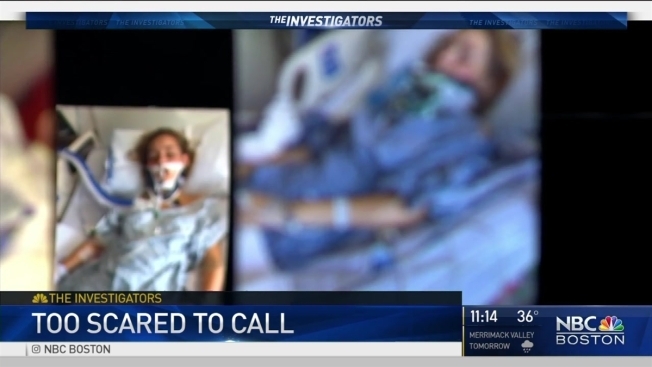 One night back in August, 15-year-old Ryleigh, whose last name NBC Boston is withholding for privacy reasons, partied along a Gardner road, drinking vodka straight from the bottle with a handful of her friends. When she got sick and passed out, her friends panicked. All but one left her there, and the last, whom Ryleigh barely knew, wouldn’t call police. Massachusetts is one of only 15 states that do not have medical amnesty, or so-called lifeline laws that protect minors who call for help when a friend has drank too much. In those other states, minors don’t have to worry about their records or their futures when calling paramedics about alcohol poisoning. The friend who remained behind with Ryleigh in August tracked down her mother on Facebook and drove the 15-year-old home, just three streets away. Aho called 911. Wrong-Way Driver Report Prompts Change in Mass. Ryleigh spent more than two weeks in a coma on life support. “The doctor came in and said to me, ‘I’m really sorry but your daughter's not breathing on her own at all anymore,’” Aho said. Aho and her other daughter sat in the hospital with Ryleigh, praying. When she finally opened her eyes, Ryleigh asked for her sister. As her daughter recovered, Aho decided to use her very personal and painful ordeal to make a difference. She posted the pictures of Ryleigh’s harrowing hospital stay on Facebook. And her story went viral. “I feel like this is our opportunity to help someone else before this situation happens to somebody else,” she said. In New England, only Maine and Vermont have lifeline laws protecting minors. Besides Massachusetts, New Hampshire, Rhode Island, and Connecticut, Alaska, Arizona, Florida, Iowa, Mississippi, Missouri, New Mexico, Ohio, South Carolina, Tennessee, and Wyoming also lack lifeline laws. Aaron Letzeiser, executive director of the Medical Amnesty Initiative, which advocates for lifeline laws, said he expected Missouri and Wyoming to consider lifeline laws in the coming legislative session. Cornell University in 2001 put the idea of not punishing underage drinkers who call for help to the test with a ne, and found that in the first year of their program, medical calls concerning students who drank too much jumped more than 51 percent, according to the university’s study of its program. Aho said she wants to make sure something like that comes to Massachusetts. “I wanted kids to know it’s okay to call for help because it was brought to my attention these kids were afraid to get help,” she said.